A rugged and waterproof crafted piece of equipment made to a very high specification. 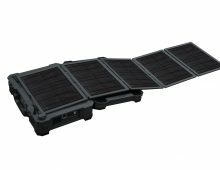 The 50 AH Wi-Fi Solar Case allows yourself or many people to enjoy a fast internet connection, either over Wi-Fi or ethernet. The case also has a 350W AC output. This will run a plasma screen and a laptop almost all day. It also allows you to charge the case using the sun, even on a cloudy day. The WIFI Solar Case can also be charged via AC. The ideal kit for adventurers, remote job sites and even drone companies. It has also been used by camera crews for its easy and rapid deployment ability. Remote access via our App and PC will give you peace of mind when you need to monitor the battery life, also protect the case if it is moved. 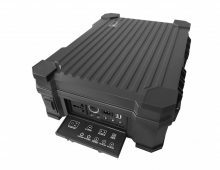 The case can be tracked via GPS and it has a special radio transmitter that allows the case to be located within a few centimetres deep inside buildings. In a few words, it’s very well protected even if GPS was not available, this feature functions across the globe. 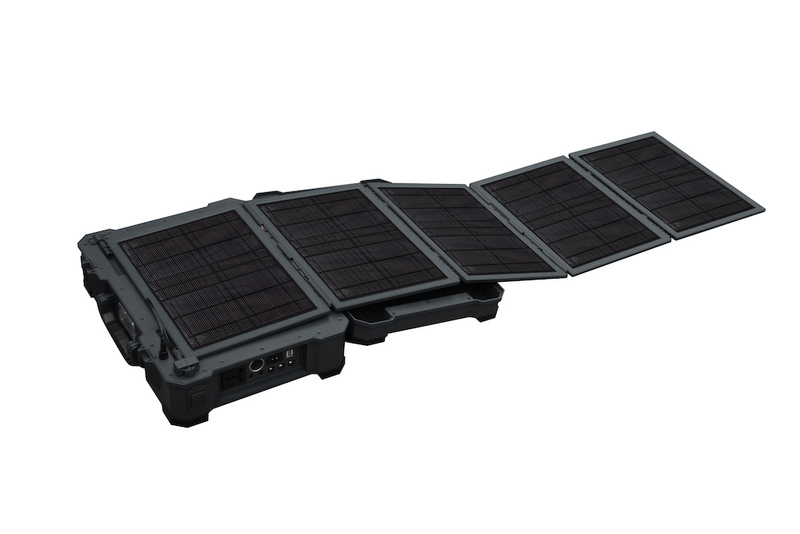 The WiFi Solar Case can be used in remote job sites to give workers a very fast internet connection for days and days. How can I get the internet using the case? 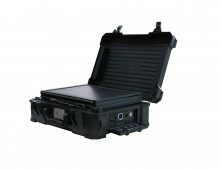 Inside the case is a router that is manufactured in the EU, its very simple and robust and very stable. When looking inside the case you will view two sim card holders. This is where you will place either 1 or 2 sim cards. There is nothing else to do. If the sims you are inserting have a data bundle per month, or maybe you are using pay and go, for example like EE or the 3 networks in the UK. These are now available with up to 24 Gb already on the sims. The router will find the best APN automatically or you can enter the software on the router and set the APN yourself. Why is this dual sim router so good? Having two sims allows the router to always give you the best and the fastest connection, if one network becomes unavailable, the other sim will take over. Also if the connection speed or the data bundle has run out, then again, the other sim will take over. Can the WIFI be turned on/off from the case? Yes, the WIFI can be turned on/off from the case by using the DC button. Another great feature on this case, especially if it’s being used for camping or where the light is very restricted. Can the Solar panels be removed from the case, yet still be connected to the case to charge the internal battery. Yes, you can connect the supplied and dedicated 5-meter extension cable that connects to the 50W 18V Monocrystalline panels. This will allow you to place the panels in a better place that might give you more sunshine. Can I add an additional solar panel, alongside the supplied one? Yes, you can. This will charge the case even quicker, using the standard pull out 50W panel, this will charge the battery in 9 hours, under reasonable conditions. Adding a further one or up to 70W will reduce the charging time. 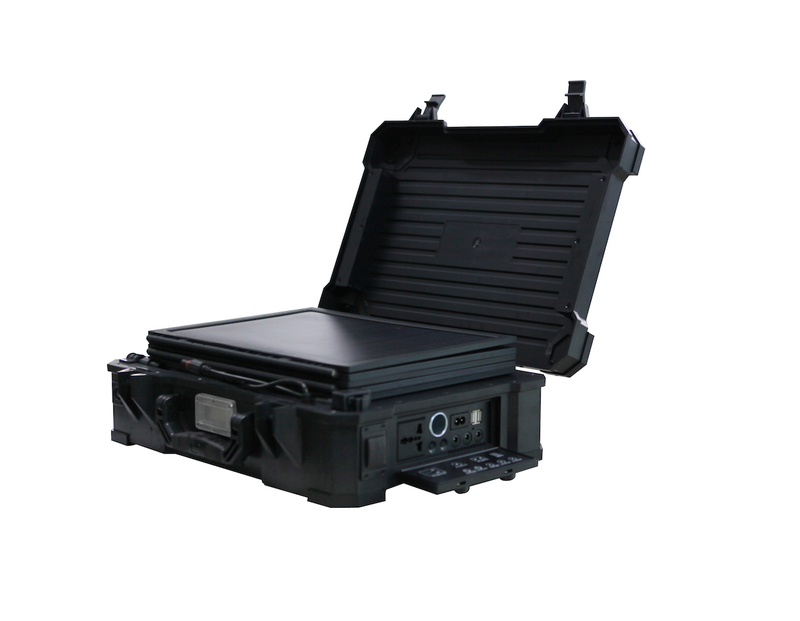 Can we place a RF transmitter inside the case for supreme accuracy within 2 centimetres, if the case is stolen. Yes, we are asked for this requirement many times. 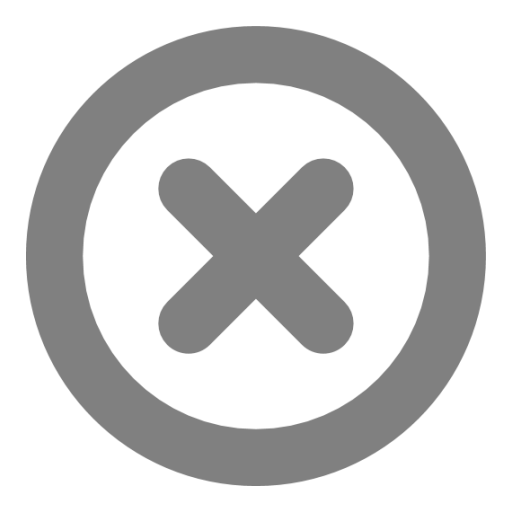 It allows you to locate the case under such extreme conditions and especially if the case is hidden deep inside a building. Does the case also have GPS inside, so if someone picks it up, can I be informed? Yes, the case does have GPS inside. You can monitor the battery of the case and view if the sun is charging the case from anywhere in the world. Also, you can arm the case, if its moved, you will be informed within seconds. You can also track the case live from 1 second. Can the GPS be switched off via the case? No the GPS cannot be turned off via the case. It can be turned off remotely via the panel or the APP. This is a safety feature. Can I charge the case using a standard AC input? Yes, the case can be charged via the opening the solar panels, or simply charge it using AC power. A charging lead is supplied. You can also charge the case via the vehicle cigarette charger. This lead is also supplied with the case. Does the case have USB outlets? Yes, the case has two USB outlets to charge mobile phones and other items that require 5V. How long will the case power the WIFI without using the solar panels? On average the case will give you WIFI up to 7-9 days. This is with the lid shut and not using the solar panels. If the case is open, and you are using the solar panels then your time could almost be unlimited. The more panels you have open, the better and faster the charging time. How do I know when the G7 WIFI case is fully charged? If the digital display shows the battery capacity is 100%, then it is fully charged. Also the panel and the APP will show you the battery level of the case. Is the case water proof? Yes, it is, we have accidently left cases outside in the rain and all is working fine. They are very robust and extremely well made. It meets the standard of IP65. What is the AC output voltage? Can you provide our standard AC output socket? AC output can only have one voltage, we will have customized the voltage according to your requirements (100V, 110V, 120V, 220V, 230V or 240V). Yes, we have three kinds of output sockets–Universal standard, US standard and Australian standard.